Western blot analysis of extracts from various cell lines using ADAMTS1 (D5G4Z) Rabbit mAb. ADAMTS1 (D5G4Z) Rabbit mAb recognizes endogenous levels of total ADAMTS1 protein. 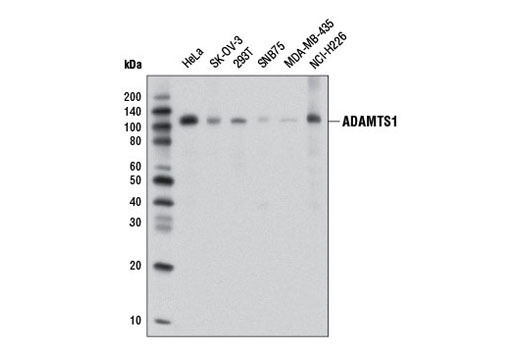 This antibody does not cross-react with other ADAM or ADAMTS proteins. Monoclonal antibody is produced by immunizing animals with a synthetic peptide corresponding to residues surrounding Arg187 of human ADAMTS1 protein. A Disintegrin and Metalloprotease with Thrombospondin Motifs (ADAMTS) proteins comprise a large family of secreted zinc metalloproteases that play important roles in various processes, including organogenesis, hemostasis, and angiogenesis (1,2). ADAMTS proteases show structural similarity to ADAM proteases, but are further defined by the presence of repeated carboxy-terminal motifs homologous to the anti-angiogenic type 1 repeats of thrombospondin-1 (3). Functions ascribed to ADAMTS proteases include regulating the extracellular bioavailability of cytokines and growth factors (4, 5), regulating cell adhesion to the extracellular matrix (ECM), and remodeling of the ECM (6). ADAMTS1 has been shown to possess potent anti-angiogenic activity in vitro (2) and is reportedly dysregulated in a number of cancer subtypes (7). Functional in vivo studies in an ADAMTS1 knockout mouse model suggested that ADAMTS1 promotes metastatic invasion of breast carcinoma cells (8). These studies showed a reduced tumor burden in ADAMTS1 knockout mice, which was linked to increased cytotoxic immune cell invasion and reduced tumor cell survival (8). Tang, B.L. and Hong, W. (1999) FEBS Lett 445, 223-5. Apte, S.S. (2009) J Biol Chem 284, 31493-7. Vázquez, F. et al. (1999) J Biol Chem 274, 23349-57. Luque, A. et al. (2003) J Biol Chem 278, 23656-65. Lu, X. et al. (2009) Genes Dev 23, 1882-94. Kuno, K. et al. (1999) J Biol Chem 274, 18821-6. Mochizuki, S. and Okada, Y. (2007) Cancer Sci 98, 621-8. Ricciardelli, C. et al. (2011) Am J Pathol 179, 3075-85.